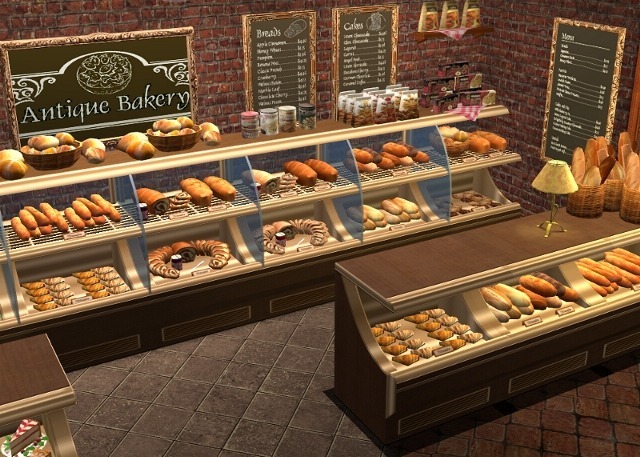 I wasn't at all happy with the default items the game gives you to make a bakery with, so I made this set. I wanted something warm looking and down to earth, with stuffed shelves overflowing with food. This set contains decorative foods, labels, a sign and menus, decorative items that fit on top of the Decra-Chill, and a half-sized Decra-Chill that works like a normal Decra-Chill but looks like a counter top display. I've also included a collection file for the set. Everything will show up under Misc/Decorative/Sculptures, except the signs, which are painting recolors, and the half-sized Decra-Chill, which shows up with the other shelves under surfaces. Quick breakdown: You'll need to use the Moveobjects cheat to get the food inside the Decra-Chill display cases. For the decorations meant to go on top of the Decra-Chill, keep in mind that it can only be placed on a fully stocked shelf. So either stock the shelf up before putting them on, or place them down first and then move the Decra-Chill underneath the decoration. The same principle applies to the labels--they only work on stocked shelves. The only expansion pack dependancies I know of is for the tall menu, which is a recolor of University's bulletin board and relies on that, and you probably need Open For Business for the Half-sized Decra-Chill. Nearly everything else is a new mesh. You'll need the CEP package for at least some of the items, like usual. Usage: Feel free to recolor, but please link back here for the meshes, and don't upload to pay sites. I want to be able to download anything you make. Additional: There is a problem with selling these when they are in the Decra-Chill case. They suffer from the misplaced stock sign bug, like all non-food items do when placed where they don't belong. I did everything in my power to try to convert these items to food, but there are just too many problems! So, I'm really sorry. 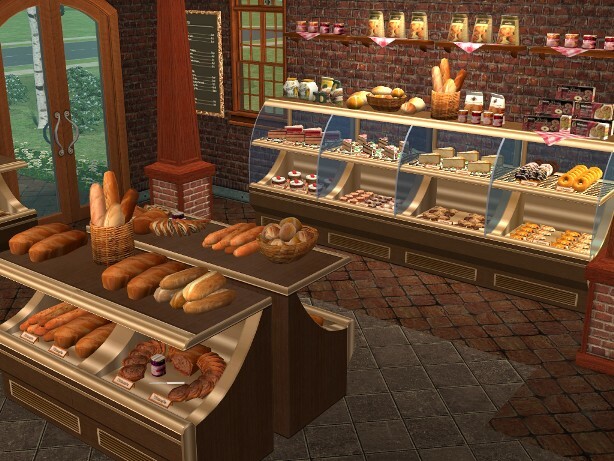 If you want to sell them, you can sell them on normal shelves, or sell them in the Decra-Chill if you're willing to restock by hand, or simply use everything as decoration to flesh out your bakery. There's just enough variety that these look great piled next to each other. Recolors: Honey wheat (default), sesame, white. Recolors: Honey wheat (default), white, marble rye and cinammon raisin. Recolors: Honey wheat (default), white sesame, marble rye, cinnamon raisin. Poly Count: A whopping 2494 polys. I really could not get it down any lower. Recolors: Also available in a triple chocolate variety. Recolor: Alternate "chocolate dipped" variety. The "Decra Deco" items are decorations for the top of the Decra-Chill. Store Sign - A recolor of "In the Beginning" painting. Two Double Menus - Recolors of "An Anonymous Masterpiece" painting. I chose these because they fit over the Decra-Chill nicely. Tall Menu - A recolor of University's "Stick Em' Up" Bulletin board. Poly Count: A slim 24. These miniature labels might be too easily glanced over for some, but I think they add a great touch. There are six, for both the bottom and top shelf, in the left, middle, and right positions. They are supposed to go in front of food in the Decra-Chill, to make it look like its labeled. The letters are in gibberish and too small to make out distinctly, so there's no need for English labels for every single food. Recolors: Comes in standard Maxis medium and dark browns. Uses a custom pale gold tray, my preferred color, which you can get from my first mod here (pretty crappy for the most part, but the gold tray is pretty). Use these as part of the counter for your bakery for an authentic look (but they are NOT a counter), put them against the wall or create an island in the middle of your floor. It works just like a normal Decra-Chill. I don't think that individual pictures of every item would be a good idea, so here are a few group pictures. Please forgive me if some of it is redundant--I hate taking screenshots more than anything, and itemizing this many items nearly kills me. But you should be able to get a solid idea of the set from these, most of it is covered. 8401 people have said thanks to mdhttr323 for this download. Kids' Bedding Collection 2- Even MORE Variety!